Walking has become one of the most popular forms of exercise. So, take a walk on our indoor walking path at Montgomery County Memorial Hospital. MCMH offers two walking paths and it is a great way to get in a walk away from rain, snow, heat or wind. So join us and walk your way to a healthier you! What is the MCMH Wellness Walkway? The Wellness Walkway consists of two different walking paths inside the hospital. If you need to get up and move after sitting with a loved one or want to use the path when the weather is bad, the Wellness Walkway is here for YOU! The Upper Level Loop is .35 miles. On this path, you will remain on one level of the hospital. Complete three loops and you have walked just over a mile! The Upper and Lower Level Loop is a .45 mile round-trip walk that utilizes the two stairwells at MCMH to give your legs an extra workout. Complete this loop twice and you have walked just under a mile! Simply follow the MCMH Wellness Walkway Apples positioned on the walls along the walking path. Follow the Apples and they will loop you back to your starting point. 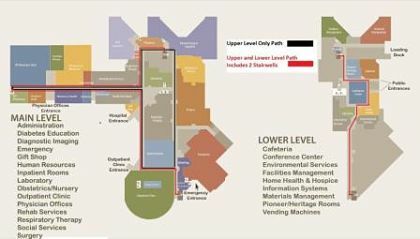 Maps are also available at the MCMH Registration Desk in the main lobby. MCMH Wellness Walkway is a hospital initiative aimed at supporting healthy lifestyles throughout Montgomery County.